Agia Marina is a resort a few kilometres outside Chania, very popular for swimming. 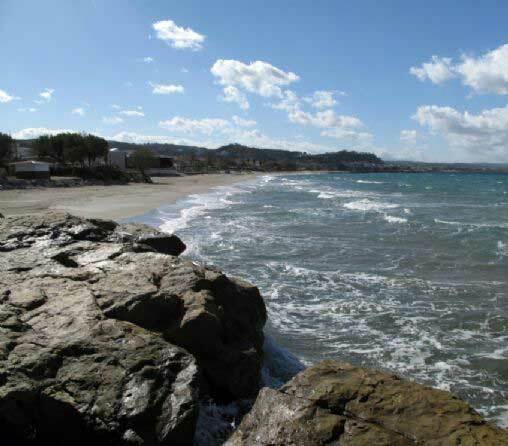 The village offers many tavernas, beach bars and a range of accommodation, much of which is situated close to the beach. There is easy access from the village to the beach. Sports facilities are available including paragliding and watersports. Plenty of facilities for sunbathing and swimming. The long sandy beach (3000 metres and 45 metres wide)can be affected by the North winds in Summer. The beach has been awarded Blue Flag status. The flora of the area is interesting with Sea Pines, Palms and white flowered, scented Sea Lilies (Pancratium maritimum). Environmental education is important for the area and there are often lectures available on Sea Turtle (Careta careta) conservation, leaflets and environmental information are on display. Thodorou Island can be viewed from the beach. The island is uninhabited. In the Municipality of Nea Kydonia, 9 km from Chania. It can be reached by regular public bus service from Chania or your own transport.